Blocks in the Simscape™ Driveline™ Tires and Vehicles library allow you to test the response of your driveline model under various and variable environmental conditions. You can also add fidelity to your model by specifying properties such as compliance, inertia, and rolling resistance for the tires and center of gravity and frontal area for the vehicle body. Couple rotational and translational dynamics. Explore a model that includes an engine, a transmission, and drivetrain-wheel-road coupling. 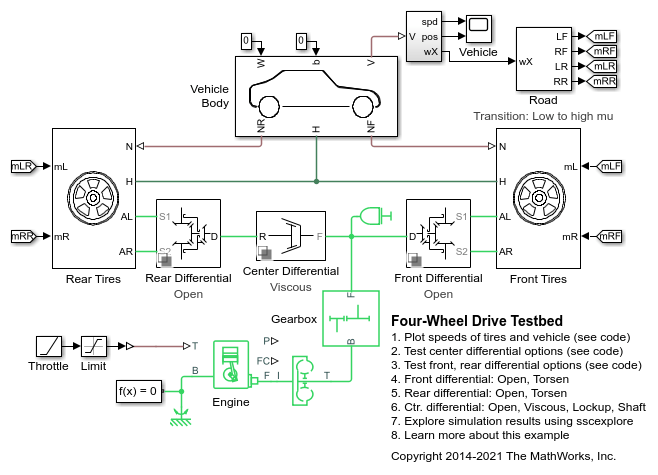 Control a Simscape Driveline vehicle using a Powertrain Blockset™ driver. Adjust surface grade and frictional properties using a Simscape Driveline Road Profile block. A diesel engine equipped with a Jake Brake (R) or compression release engine brake. This type of brake is activated by the driver to slow the vehicle without relying on friction braking mechanisms. Air is released from a number of cylinders at the end of their compression strokes. 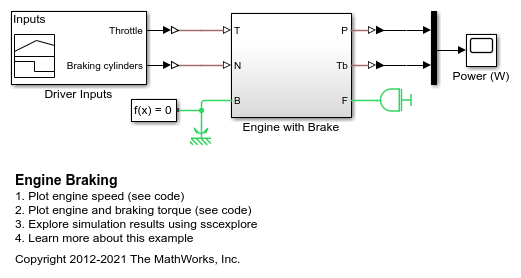 In this example, the driver can dynamically select to activate braking on zero to eight cylinders. The braking torque for each cylinder is set using a lookup table with engine speed as the input. A four-wheel drive vehicle with open and limited slip differentials. The front and rear differentials can be standard or Type I Torsen. The center differential can be a solid shaft, viscous coupling, viscous coupling with a locking clutch, or open with no torque transfer. The differential options are in variant subsystems. The variants can be selected using the hyperlinks embedded in the model. 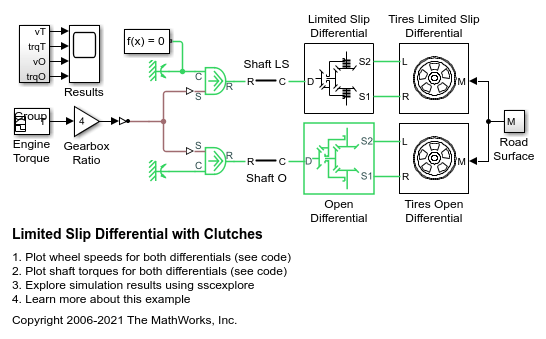 A comparison between the behavior of an open differential and a limited slip differential with clutch packs. The limited slip differential is modeled using components from the Gears library and Clutches library in Simscape™ Driveline™. Wheel slip is limited by clutches that engage when the torque applied to the input of the differential exceeds a threshold. The clutches lock the differential so that the output shafts of the differential spin at the same speed. The effect of varying the number of cylinders in a piston engine. Four, six, and eight cylinder engines are included with firing offsets evenly distributed about their four-stroke cycles. Piston pressures are normalized by the number of cylinders to emphasize the effect on output vibration. 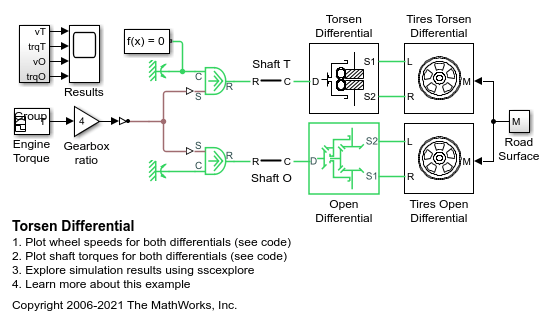 A comparison between the behavior of an open differential and a Torsen limited slip differential. The Torsen differential is modeled using components from the Gears library in Simscape™ Driveline™. Slip is limited in the Torsen differential because it uses non-backdrivable worm gears, which are modeled by Sun-Planet Worm Gear components. The result is higher torque applied to the wheel with greater traction, and identical speeds for the left and right axles. The basic architecture of a two mode hybrid transmission. It consists of three planetary gear sets and four clutches. This combination permits four fixed gear ratios plus two power-split modes. The power split modes are used to transition between fixed gear ratios and for heavy acceleration/deceleration. The fixed ratios help with efficiency when cruising. For the first power split (input-split regime), only Clutch 1 is engaged. For the second power split (compound-split regime), only Clutch 2 is engaged. Engaging two clutches simultaneously removes one degree of freedom and hence results in a fixed ratio. 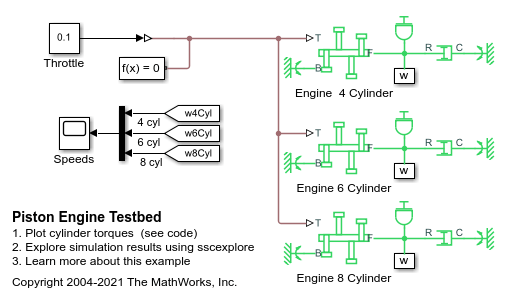 Two equivalent simplified vehicles modeled in Simscape™ Driveline™ and Simulink®. 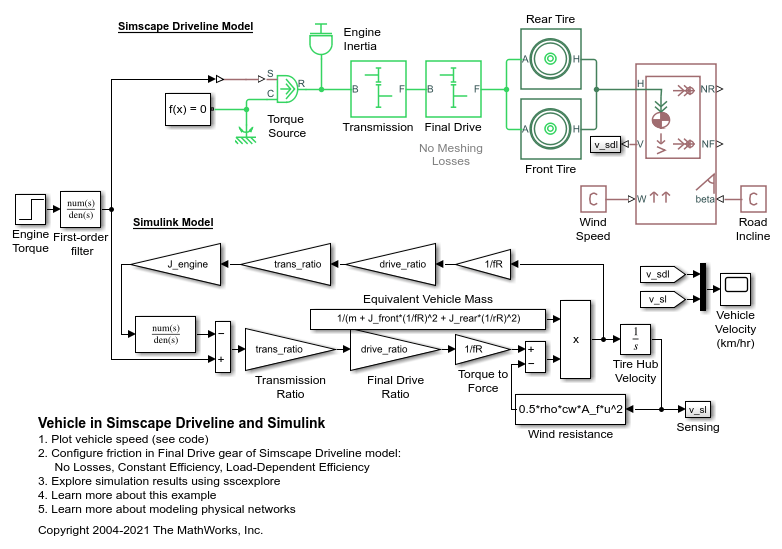 The simulation results are identical, and the Simscape Driveline model is easily extensible to include different effects and a higher level of modeling fidelity. Meshing losses in the gears and more detailed tire modeling can be added without introducing algebraic loops. A vehicle with a five-speed automatic dual-clutch transmission. The transmission controller converts the pedal deflection into a demanded torque. This demanded torque is then passed to the engine management. The pedal deflection and the vehicle speed are also used by the transmission controller to determine when the gear shifts should occur. Gear shifts are implemented via the two clutches, one clutch pressure being ramped up as the other clutch pressure is ramped down. Gear pre-selection via dog clutches ensures that the correct gear is fully selected before the on-going clutch is enabled. A complete vehicle with Simscape™ Driveline™ components, including the engine, drivetrain, four-speed transmission, tires, and longitudinal vehicle dynamics. The transmission controller is implemented as a state machine in Stateflow®, selecting the gear based on throttle and vehicle speed. A four-wheel drive vehicle starting from rest and ascending a 15 degree incline. 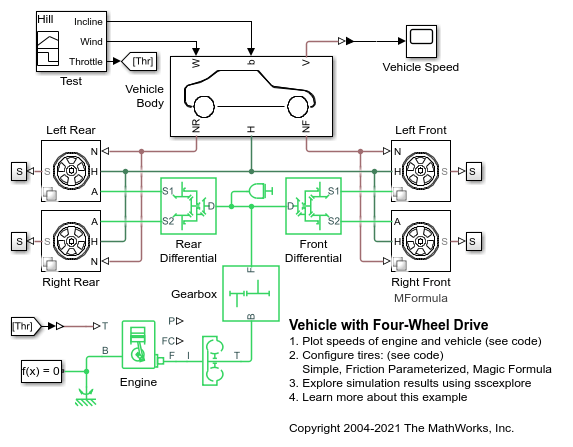 Initially the vehicle rolls backwards until the engine develops sufficient torque to counter the slope. The tire compliance dynamics can be seen as the vehicle starts to accelerate. The model variant chosen for all of the tires can be set to the Simple, Friction Parameterized, or Magic Formula tire model using the hyperlinks in the model. A vehicle that has a four-speed manual transmission. The key elements of the transmission are four synchronizers. By engaging or disengaging these synchronizers and associated dog clutches, the transmission provides four ratios 3.581, 2.022, 1.384, and 1, respectively. The synchronizers are modeled using the Cone Clutch and Dog Clutch blocks.